IT is always fun to learn new stitches and this stitch is a favorite of mine. The yarn over slip stitch (yoslst) also know as the Half Double Slip stitch is a really great way to get the look of a knit without actually knitting. By working this stitch in the back loops you get a texture that resembles alternating knit and purl stitches when knitting. I just love being able to get the look of knit without having to learn a new craft. 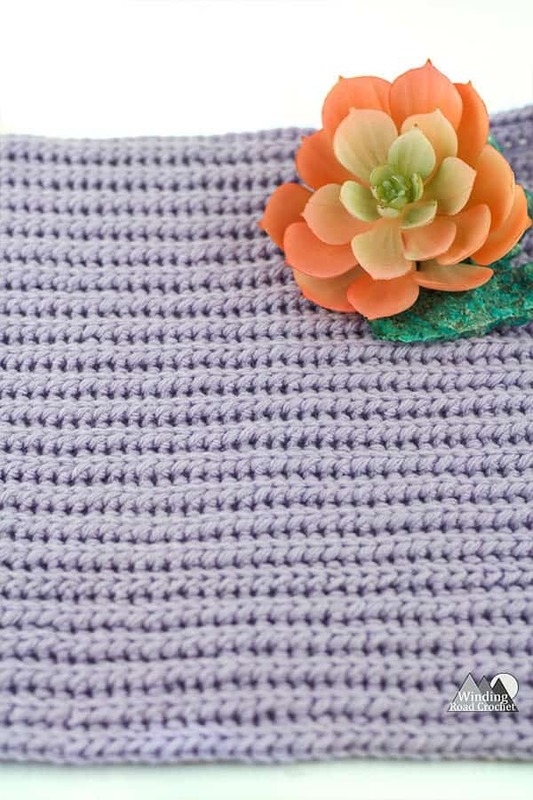 This stitch is one of the stitches included in the March Texture Madness Crochet A Long. You will be able to find 3 different size sample patterns below. These can be used in my Crochet Sensory Baby Book Pattern and two other patterns included in the Crochet A Long. I have also used this stitch to create a ribbed look on the sleeves of the Sweet Heart Sweater, the Tons of Texture Slouch Hat, and the Granite Rib Throw. You can also join my Facebook group Our Crochet Journey where we share, discuss, help and inspire each other with our crochet and yarn crafts. I would love to see you in our community! Making handmade gift this Christmas? Check all my free pattern here. For a sample swatch the gauge is not important, but if you are using your swatches for the March Texture Madness Crochet A Long you will want to check your gauge. Gauge is determined by using the Single Rib Stitch. I almost always work my YOST in the Back Loop Only so it creates a knit like rib texture. When working the Yarn Over Slip Stitch can start with any number of chains. Please note that I do not count my turning chain as a stitch. For the Large (Blanket) 12 inch Swatch we will chain 49. For the Medium (Book) 8 inch Swatch we will chain 33. For the Small (Block) 4 inch swatch we will chain 17. Please note, if you use a Ad Blocker it may block this video. Note: I do not count my turning chain as a stitch. Ch 20, 30, or 52 depending on the size sample swatch you would like to make. R1: YOST in the second Ch from the hook and ever Ch across. R2-? : Ch1, turn, YOST in the BLO in every stitch across. You will continue repeating Row 2 until your project is as big as you would like it to be. To make a 12 inch square work until you have a total of 54 rows. To make a 8 inch square work until you have a total of 36 rows. To make a 4 inch square work until you have a total of 18 rows. Ch1, working down the side of the rows, Sc into the side of each row, Ch1, turn at the corner, Sc in the bottom of each St across, Ch1, turn at the corner, working down the side of the rows, Sc into the side of each row, Ch1 , turn at the corner, Sc in the top of each St. Ch1 slip stitch to the first Sc of the border row. Now your sample square is complete and ready to be used in one of the three March Texture Madness Projects. Did you like the tutorial? Share your stitch swatches with me on any social media and tag me @Windingroadcrochet, #windingroadcrochet, #ourcrochetjourney. Let me know how you like the stitch in the comments below. Will you use it for a project? Check out all my free patterns here and see a few of my popular patterns below. Written pattern, tutorials, graphs and pdfs for the Yarn over Slip stitch tutorial are copyright Windingroadcrochet.com. Please do not reprint or repost this content as your own, but please feel free to share this link with others. You can find more information on sharing my work with others in the Terms and Conditions Page. Interesting. How does the final fabric compare to doing hdc in the ‘third’ loop/back hump? Biggest difference is how far the “v”s are from each other. I find the Yarn over slip stitch has the “v”s made on the side closer together and I like that look better. Depending on the pattern I will sometimes use the HDC in the third loop instead. The Yarn over slip stitch is also a little shorter of a stitch, but not by much. Also I really have to say the Yarn over slip stitch in the Sheep Chic has a ton of stretch. I think this is very yarn specific but I was impressed by it. I am definitely going to design some hats with this yarn and stitch. How do you crochet hat with this stitch? You can do it one of two ways. I refer to using it as the hat brim in the video. I would crochet this stitch to be the length of the brim and then sew the ends together and work along the side of rows to create the top hat section. I do this is my https://www.windingroadcrochet.com/tons-texture-slouch-beanie-free/ hat. You could also make each row the length of the entire hat, crochet until the piece is long enough to go around your head, seam the top and bottom of the piece together and gather one side to close the hat.